More men are signing up to be nurses, if the numbers at the polytechnics and health-care institutions are anything to go by. Many of them cite job stability and the rapidly growing health-care sector as major pull factors. At Nanyang Poly (NYP), 18 per cent of the 600 students on its nursing course this year are males. This is up from the 14 per cent in 2010. At Ngee Ann Poly, male students made up 15 per cent of the cohort when its nursing programme started in 2005. This has since gone up to 20 per cent. "The career prospects are very good because we have an acute shortage of nurses," said Ms Wong Luan Wah, NYP's director of nursing from the School of Health Sciences. The additional demand for nurses each year is projected to be about 1,400 on average until 2020, said the Health Ministry. 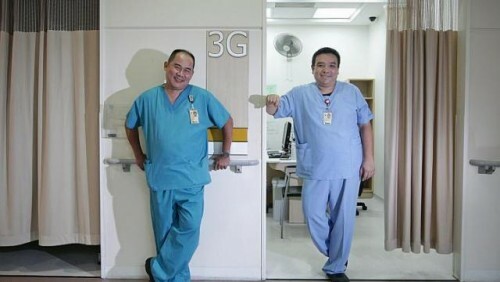 Regional health-care clusters like SingHealth and the National Healthcare Group (NHG) have had more male nurses in the past five years. A cluster is typically anchored by a hospital but includes institutions like polyclinics. The number of male nurses who are Singaporean and permanent residents employed by SingHealth has gone up by 52 per cent, said a spokesman. Part of the reason for this is nursing is no longer seen as an exclusively female profession. "Nursing is no longer stereotyped or perceived by the public as a job mainly for women," said NHG chief executive Chee Yam Cheng. And male nurses can be helpful in some situations. "An added plus is that their physical strength enables them to lend a helping hand when we manage the movement of immobile patients," said Dr Tracy Carol Ayre, group director of nursing at SingHealth. Tan Tock Seng Hospital senior nurse manager Christopher Soh, 38, who has been in nursing for 13 years, said no one day is the same. "We see a diversity of patients here. No one patient is the same."